Is it Legal for Banks to Put Holds on Payroll Checks? Banks often put holds on payroll checks to ensure the money will clear before making it available to you. This is done to protect the bank’s interest and reduce potential fraud. It is legal for your bank to put holds on your payroll checks but only for a limited time. What Is MIP on a W-2 in Michigan? Banks are required to make available the first $100 of your payroll check by the next business day after your deposit. 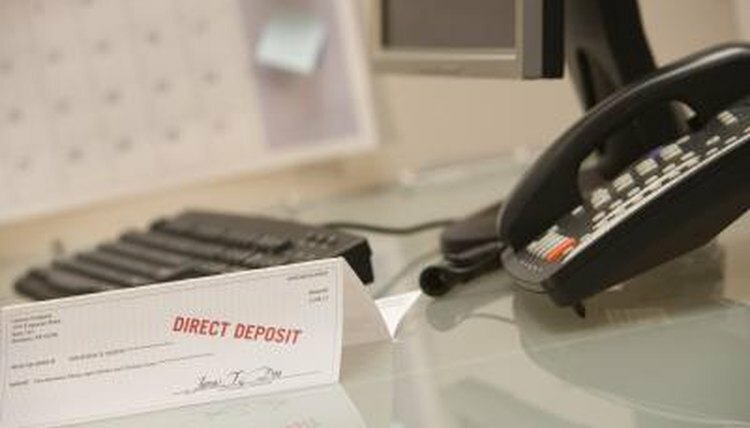 Banks can define a business day as they see fit, however, so it is possible to deposit your check on Friday and not have that first $100 available until the following Tuesday. By the second business day, your bank must release the rest of your paycheck. So if the first $100 became available Tuesday morning, the rest--up to $5,000--must be available by Wednesday morning. If your payroll check totals more than $5,000, your bank has an additional 10 days after your initial deposit to make available any amount over $5,000. Many banks allow customers to cash their paycheck first and then deposit the cash into their account. This gets around the hold time and makes the funds available immediately. "Mastering Negotiable Instruments: U.C.C. Articles 3 & 4 and Other Payment Systems," Michael D. Floyd; 2008. Ferland, Carrie. "Is it Legal for Banks to Put Holds on Payroll Checks?" , https://legalbeagle.com/5763117-legal-put-holds-payroll-checks.html. Accessed 18 April 2019.